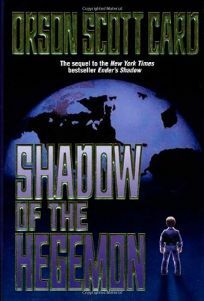 This fine follow-up to Ender's Shadow features that novel's hero, Bean (now a young man), wrestling with Card's trademark: superbly real moral and ethical dilemmas. In a world between wars, filled with ambitious countries jockeying to carve up their neighbors, the children of Battle School are the strongest asset a nation can possess. The greatest of the children, ""Ender"" Wiggin, has gone off to colonize a new world. The second best, Bean, is hunted by a young psychopathic genius, Achilles, who schemes to conquer Earth with the aid of Ender's soldiers. Peter, Ender's brother, who was too ruthless to make it to Battle School, also works to rule the planet, but through more peaceful, political means. Bean must decide if becoming Peter's shadow and guiding him to become Hegemon will help defeat Achilles, and if one boy's megalomania will make a better world than another's. Children playing at war as if it were a game recalls Card's most famous work, Ender's Game, which won both a Hugo and a Nebula award. The complexity and serious treatment of the book's young protagonists will attract many sophisticated YA readers, while Card's impeccable prose, fast pacing and political intrigue will appeal to adult fans of spy novels, thrillers and science fiction. (Jan. 2) Forecast: Card is immensely popular; this is one of his best novels. Like Ender's Game, it will soar on genre lists and should flirt with, and perhaps woo, regular lists. Tor will ensure this through a $300,000 ad/promo campaign including a nine-city author tour.